The following article well explains why the Shemitah end-of-year phenomenon did not manifest in the way that it was predicted to. However, that non-event on and around Elul 29 has nothing to do with escaping the inevitable and powerful effects of the Shemitah. After all, the Biblical Shemitah Jubilee has yet to begin on the evening of September 22nd and continuing on Yom Kippur on September 23rd. The Jubilee year is always declared on the Day of Atonement. It must also be noted that the Shemitah has already had tremendous repercussions in the form of the bankruptcies of both Greece and Puerto Rico. This summer has seen the Chinese stock market crash as seriously as the 1929 NYSE crash, as well as a 10% decline in the DJIA over a 4 day period in August. There is also the ever-worsening immigration crisis in both the EU and USA. That unprecedented mass exodus alone is the sure sign of the Shemitah, just as one occurred during the biblical Exodus of yesteryear, also on the Shemitah. Because the expected debt correction and subsequent balancing of society, which accompanies every Shemitah, did not occur, that can only mean that a much greater event — really, a series of events — will unfold with awesome speed and impact. As the article below points out, because the traditionally Judeo-Christian nations of the USA, UK, EU and Israel did not get their houses in order, they will be put in order by the workings of the upcoming Super Shemitah. Hence, what can now be expected is a Super Shemitah finale — yearlong — that will make the last two Shemitah years look like a walk in the park. The Shemitah DID NOT Happen As Expected…Why? Many of us have been baffled by the non-event of the Shemitah of 2015. I am sure that there are those who have thrown up their hands and said to themselves “this whole Shemitah thing is a bunch of Bravo Sierra”! Unfortunately, the information you have received prior to the Shemitah of 2015 was incomplete. Writers like Johnathan Cahn and others have done an outstanding job at bringing the subject of the Shemitah and some of its nuances to light, but they have focused primarily on symptomatic issues, various causes, and how this all fits into past history. Though much of the information presented by these writers is right on the money, what these writers have not done is viewed the Shemitah in the context of how it really works in the biblical sense as a mechanism of legal justice. This is a critical point of the Shemitah, otherwise what happens is we get stuck focusing in on the various shades of law versus the ultimate legal verdict. The word “Shemitah” is a legal term that comes from the Torah of Moses, the first five books of the Scriptures. Shemitah in the Hebrew means a “legally permanent release”. The root idea of the word Shemitah in the Hebrew means to “violently throw something down with force—to utterly destroy something”. To a biblical court of Law, the Shemitah was a time-sensitive, permanent legal release that was to absolutely abolish whatever legal issue was at stake. To those of us here in America we have witnessed some of the financial aspects of the Shemitah at work firsthand. The most recent economic crashes of 2001 and 2008 on the specific Jewish calendar date of Elul 29 have led many to a keen interest in the Shemitah cycles and its potential impact on our markets. The pattern we have seen in the past Shemitah seven year cycles was perfect, precise, very Torah, very much like how the Creator always does things: with absolute precision. 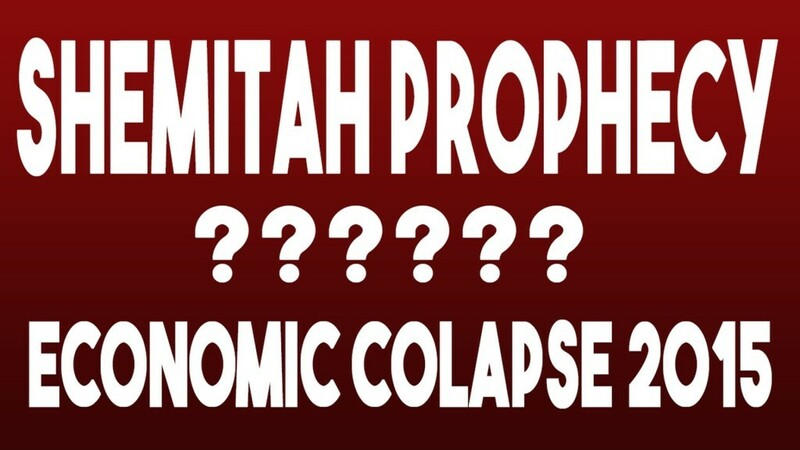 To anyone with any sense of mathematical probability, there is no way you could have had multiple consecutive economic hits to the American economy on the same critical Shemitah date, Elul 29, as outlined in the Biblical Laws of the Shemitah seven year cycle. It is statistically impossible. So, if the pattern were to continue on consistently, a major economic shake up, one of greater severity than the past cycles, should have happened on or right around Elul 29 (Friday or Monday) in order to properly fulfill the biblical outlines of the Shemitah as we have seen them done in the last two cycles (2001 and 2008). Again, the Creator is a precise being. He does not play games; nor does He just make it up as He goes. He has placed certain laws at work that function perfectly towards a perfect outcome. OK then…what’s up? Why no huge economic correction on or prior to Elul 29, 2015? It came and went and nothing really happened??? Let’s answer these questions with another foundational question: why is a seven year cycle of debt release even necessary? When a corporate nation of people have a Judeo, G-d of Abraham legacy, such as ancient Israel, and such as the United States of America, the Creator has a unique economic outline for their financial dealings. The Scriptures spell out in detail how that nation is to conduct its business affairs corporately and personally. This economic outline is based on a precise seven year business cycle. When that seven year cycle is complete, any financial debt is zeroed out, and a new cycle commences with everyone, including the nation itself, having a clean slate. Unfortunately, as good as this system sounds, and as much sense as it makes, greed, in the end, usually wins out—and perpetual debt is “the” vehicle of greed. It is very difficult for greed to get much traction in a seven year business cycle that zeros out and starts over. Biblically this is why it was designed this way. The Shemitah, in essence, was purposely designed by G-d for His people to keep greed, and the accompanying debt, from overtaking the society. This was to be done in complete contrast to the pagan world which relished in greed and debt, and eventually imploded on itself every time. In the past, both in ancient Israel and in America, debt has played a key part in the fate of the nation. In both, we see debt based boom-bust cycles take place. At times in the history of both nations the debt load was not too significant, thus the zeroing out bust was not too significant. In other times the debt was substantial, and historically we have seen substantial economic busts take place—like in King Ahab’s time; and as we see in the 1930s depression in America. But nothing has compared to the outright debt binge of the modern era. We, as a nation, have literally annulled any idea of real debt satisfaction, but have incorporated a financial system based on perpetual debt with continually growing deficits. This perpetual debt system has allowed America, and the West as a whole, to live off of excessive, ever expanding debt to the eventual tune of trillions and trillions of dollars, an amount that is realistically inconceivable. Never in the history of the world has there been this kind of debt by a debtor nation, especially one with its own history so intertwined with the G-d of the Bible. With this staggering amount of debt in play, a debt that was to be biblically paid up prior to every end of the seventh year Shemitah, we have witnessed historically the Creator’s direct intervention in our financial affairs. We have seen smaller financial interventions when the debt amount owed was relatively small, as in the 40s, 50s, and 60s. But as the debt load has increased and carried over each seven year cycle, the seventh year crashes have become more and more significant, as in the 70s, 80s, and 90s. This has become even more apparent as the most recent seventh year crashes have specifically taken place on Elul 29, the very last day of the biblical Shemitah in 2001 and 2008, almost as if someone is trying to get something across very, very clearly. But it is obvious we are not getting it. Even as the seventh year crashes become more and more serious with each passing Shemitah, America is continuing headlong into debt hell with no end in sight. So, for those watching and trying to understand the Shemitah cycles, it would seem like this Elul 29, 2015 would be a no brainer. I mean, come on, in order to keep the building crescendo of a seventh year crash pattern keeping lock-step with our own immense debt ballooning into the stratosphere, we should have seen a bloodletting on the financial streets on Elul 29 of catastrophic proportions with all kinds of super precise number drops, like the Dow losing 7,777 points, or something…right? And yet, Elul 29 went by without a whimper…. Unfortunately, we are missing some key pieces of data regarding the Shemitah that are absolutely necessary to get the whole picture for what all this actually means. Please understand: the Shemitah is technically a legal mechanism. Sure, it can be viewed in a prophetic sense, and, as such, viewed as a warning, a harbinger of things to come, if you will. But more importantly, the Shemitah’s primary function is a scale balancer—it zeros out the imbalances. This was its function in the Bible, and this has been its function in our own financial history. So let’s put this into proper legal perspective. The past Shemitahs in which we have seen the precise seven year pattern at work have been ultimately “corrective”. The point losses on Wall Street and the result to the economy have CORRECTED the incorrect financial imbalances of improper gains made by improper debt. The losses incurred by the date of Elul 29 every seventh year made things judicially correct. In essence, the price of not clearing the debt at the Shemitah was ultimately cleared by the Creator. In other words, G-d has used the past Shemitah economic hits as warnings; but He has also “corrected” the transgression by forcing financial loss on the transgressor and balancing the scales. This is the ultimate goal of the Shemitah concept in the first place. The whole point of the Shemitah is to make things financially right for everyone. So the crashes we have seen in 2008, 2001, and those prior, have had much to do with a certain legal satisfaction. America’s debt cup was full at the end of these Shemitah cycles. Naturally, we would view these crashes as punishment…and in some ways that is not too far off. But what we are missing is the fact that “technically” the Shemitah WAS satisfied by the resulting losses. Literally, the greed gains of the debt cup were emptied, zeroed, in large measure by the losses that occurred at the end of these Shemitah’s. Thus, America was given another seven year cycle with another chance to redeem itself. Sadly, America has not learned from its many chances. And as Elul 29 has come and gone, we now find ourselves in a whole new ball game. The pattern has changed. Elul 29, 2015 was a no show. Folks, this is EXACTLY how the Creator did it with the Kingdom of Judah before the final fall of Jerusalem in the Prophet Jeremiah’s time. The narrative parts of the Book of Jeremiah, in essence, really revolve around two main Shemitah issues: the land Sabbath of the land of Israel; and financial debt release. Read it and see. The Old Testament spells it out clearly. During the last years of the Kingdom of Judah, roughly around 600 BC, at the end of the seventh year Shemitah cycle, the Powers-That-Be in Judah refused to financially release the debt servants of their debt obligation, as was to happen at the time of the end of the Shemitah. On top of this, the Leadership of Judah also refused to Sabbath the Land during the Shemitah year, as was required. So what did the Creator do? He intervened by taking a portion of the royal house of Judah and putting them into continual slavery (this is where we see the story of Daniel); and He took a portion of the Land of Israel and made it “Sabbath” through desolation—a Hebrew term meaning “not worked agriculturally”. These two aspects of Shemitah consequences were all done PRIOR to the final judgment of the destruction of Jerusalem. Literally, these acted as a corporate warning to the nation of Judah, and, more precisely, it was a temporary corrective measure to put things back in proper judicial balance according to the Laws of the Torah. This exact measurement of a well-defined consequence perfectly fulfilled the judicial outlines of Torah Law, and it temporarily “corrected”, brought into balance, the corporate Shemitah transgression of the House of Judah. Eventually, when it was clear that the Kingdom of Judah would not heed the warnings nor the consequences, the Creator had the Kingdom of Judah “judged with completion”, and this is exactly what we see in the Book of Jeremiah. We historically see the ultimate judgment of Jerusalem by a complete land desolation; and all the powers that be in the royal house of Judah and any in leadership were killed or put into permanent slavery—just like what they were perpetrating against those who were supposed to be released. Thus, we see the Creator in the Scriptures use warning; then very definable correction; and ultimately we see a final judgment—a destruction of the violator. For all intents and purposes it all seemed rather anti-climactic. And yet, if we honestly assess our situation, as a nation we have gone way more debt crazy than ever. We did not release our debt at the end of the seven year cycle; we did not correct our deficits; we did not reign in our budgets; we did not pay off our creditors. As far as the Shemitah is concerned, we operated exactly like the Kingdom of Judah. We did not heed the warnings, nor the corrections. And so, here now is the terrifying part…. The Creator did not “correct” it for us this Shemitah…. Our debt to others, to our creditors, is STILL OUTSTANDING this Shemitah, and our ill-gotten gains via unjust debt were not balanced out by major losses as in the past…. Nor was the personal debt cleared at the end of the seven years, the populace as a whole is still in perpetual debt servitude this Shemitah, more than ever…. Understand, the Creator has not JUDGED us in the past seven-year cycles because He has CORRECTED it mathematically for us without us even really understanding what He was doing. The past Shemitah economic hits were mercy hits. They cleared our slate to an extent and balanced the scales enough to allow us to keep going. Now, we stand with no real meaningful mathematical correction as this Shemitah has concluded, and now we can be JUDGED. A massive debt is still owed. The debt has not been cleared. It has not even truly been balanced out as it was at the end of prior Shemitahs. We are today guilty as a corporate people. Does this mean we won’t see future economic hits? No way—we most certainly will—and soon. Our financial slate was not cleared and our financial issues are still hanging. But this time there will be a permanent slide down, not a correction like in the past. You see, what this means is we have gone from a “corrective” phase to an ultimate “judgment” phase. And judgment will take its final course just like it did with the ancient Kingdom of Judah. To put this into real-world terms, in the Creator’s eyes, China, Russia, and many other enemies of America have a legal claim over us because of outstanding debt we owe and have not paid at the Shemitah’s end. America has lived an extravagant lifestyle it could not afford. America issued various debt instruments to continue to live this extravagant lifestyle; and then created fiat money out of thin air to cover that debt—in essence, more debt to cover more debt. Out of pure lunacy, America has borrowed this ever growing debt in large part from its enemies just to keep their greed driven “good life” going at all costs. America does not pay off this legitimate debt with just payment for goods and services received; nor can it mathematically pay off this monolithic debt; nor does it ever intend to rightly pay off this debt in any real way. America and its criminal bankers in the West, on the other hand, have continually exacted payment from the masses. Whether from another country being bullied into debt submission (like Greece), or down to the family being thrown to the streets for late payment, the western banking industry and its political establishment has two sets of rules—one for itself, and another for everyone else. It absolutely demands to be paid what it is owed, on time and with interest; and yet, at the same time, America and its western elite continue to pile on debt it can never repay. Please, please understand—this will not stand with the Creator. He is a G-d of Justice. The Creator has rules. The rules have been disregarded. The Creator has warned. The warnings have been disregarded. The Creator has shown mercy. The mercy given has been mocked. The Creator will now intervene in ways much more catastrophic than any mere economic correction. 6 Shall not all these take up a parable against him, and a taunting proverb against him, and say, Woe to him that increaseth that which is not his! how long? and to him that ladeth himself with thick clay (means incredible debt load in the Hebrew)! What this clearly states in this passage, especially when read in the ancient Hebrew, is that there is an End-time nation spoken of that has a massive amount of debt that they have used to live an extravagant lifestyle way beyond their means. This particular nation in the Last Days has defrauded other nations using an international debt scheme in order to keep underwriting its insatiable desire for more. These nations who have been defrauded will rise up in war and take booty as financial compensation for what they are owed. It will be violent. All the inhabitants of this perpetrating nation will feel the impact firsthand. Most will die. And, dear reader, this is EXACTLY what happened to the Kingdom of Judah. They received their warnings, their times of intervened correction, their mercy—but they did not heed it—and their fate was an unspeakable judgment. They were beset by war, a deadly siege of their homeland, and a famine so bad they ate their own children. America, the Creator has spoken, or more accurately stated, has not spoken this Elul 29, 2015. He did not intervene on your behalf this Shemitah. America, your fate is now sealed. For those of us reading this please understand it is time to get your house in order once and for all. A war is coming. America will be invaded by its creditors—China, Russia, and others. This is the inescapable biblical scenario….